It is with great sadness that we announce the passing of Marlin Frederick Swan on April 9, 2017, following a brief battle with liver cancer. Marlin is survived by his wife of 59 years, Alice; children Darrell (Kerry), Tim (Dorelyne); grandchildren Amanda (Scotty), Victoria (Rhys), Alexandra (Darcy), Joshua and Cassidy; step-grandchildren Bradley, Ashley (Byron), Amber (Cole) and Dustin (Indy), great grandchildren Damien, Kelton, Benjamin and Jasmeha. Also left to cherish his memory are his sisters Beryl, Sharon and Winnifred; brothers Lionel, Wayne and Reg; and his step mother Rita. Predeceased by his son Delbert in 1987, his daughter Judy in 2000 and by his parents Frederick and Emily. Marlin was born June 26, 1934 on the family farm in Preeceville, Sask. 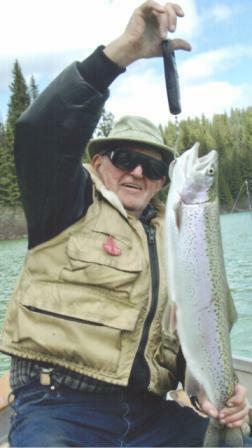 He moved to Kamloops in 1956 and met the love of his life Alice Woods. They married in 1957 and had four children. Marlin worked for the CNR out of the Mountain Division, based in Kamloops, for 34 years. He had a great love for the outdoors and spent countless hours enjoying all parts of BC – he met many new friends. Marlin selflessly gave himself to family and friends and will be missed dearly by all who knew and loved him. The family would like to thank Natalie Manhard (NP), Dr. Farren, HCC nursing and staff at the Marjorie Willoughby Snowden Hospice. As requested, there will be no formal service. In lieu of flowers, please consider a donation to the Marjorie Willoughby Snowden Hospice or to a charity of your choice. So sorry to hear of Marlins’ passing. May memories comfort you and bring you peace during this difficult time. We remember him from work and curling.